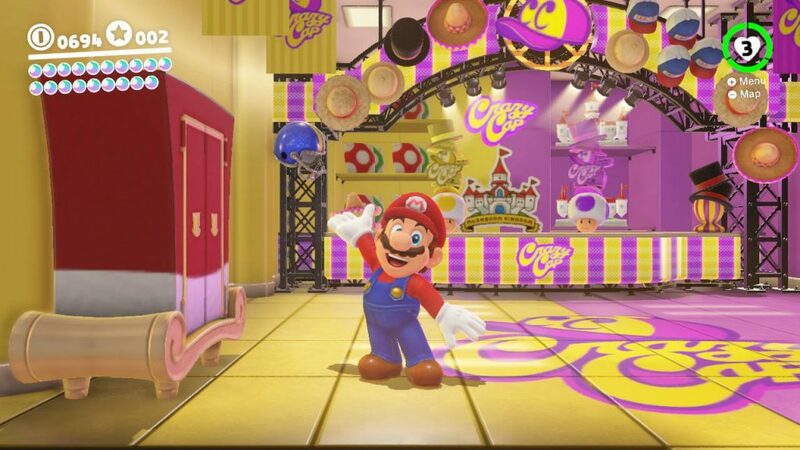 Super Mario Odyssey is a great example of a revolutionized platformer, with the use of his hat, Cappy, Mario has access to a whole new set of abilities and skills. Not only can the hat be used to attack, but it can also be used to take control of enemies and utilize their abilities as well. Among all other features, I believe the technical addition of the hat has made the most impact; by this I mean your ability to jump on it and add additional movements. Taking the time to learn your jumps and hat techniques will definitely have immediate pay-off. Crouch jumping (ZR + A) will allow you to reach new heights without the build-up of triple jumping. Long jumping (Left Control Stick Forward + ZR + A) will help you reach ledges that might have seemed impossible to reach. Above all else, the hat jump technique is both the most difficult and most useful to learn. In step by step fashion you start by jumping with A, then you throw your hat out with Y — make sure to continue holding Y — then press ZR followed by releasing, pressing and holding Y in that order. Here’s a short video of what it should look like. One you’ve mastered the hat jump, you can add extra’s to the end, like another reach jump (ZR + Y). Or you can add things before, like a crouch jump into a wall jump, into the hat jump. This technique will allow you to get to places you might have thought too high or far to reach before, or allow you to skip otherwise challenging areas. Don’t forget, this game rewards skill by hiding things in hard to reach places, so put the new technique to work and best of luck exploring the Super Mario Odyssey worlds.